The impacts of international tourism are many and at times they become a doubled edged sword. The importance of sustainable practices and 'giving back' are keys to moving toward a positive future for all. Remote River Expeditions staff and management are whole heartedly committed to the principals of sustainable tourism, low impact camping and of having a positive impact on the places we live and work. We understand that respect of the people and environment are of the upmost importance. 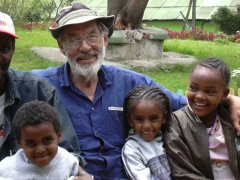 During our long history of living and working in East Africa and Madagascar we've developed a deep love and respect for the people and their homes. We're fully committed to supporting the people and countries we visit. As well, we recognize the importance of addressing the global issues of resource conservation, especially where people and rivers are concerned. Among other efforts, we employ and train local staff whenever possible. Our ongoing river guide training in Ethiopia recently led to a historic expedition. 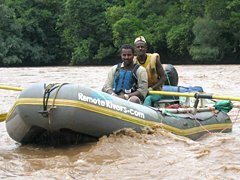 In September 2004, Johannes Bekalu became the Ethiopia's first white water river guide, rowing his own boat on the upper section of the Omo River! Congratulations go out to Johannes for a job well done and to everyone that assisted in his training. 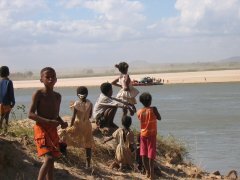 Remote River Expeditions is continuing to train young men and women in Ethiopia and Madagascar and in 2005 we'll run the first ever formal Ethiopian White water Guide School on the Blue Nile River near Bahir Dar. maybe found on our Links Page.